Austin Agada, a former student activist and North Central Coordinator of National Frontier, a Civil Society Organisation said that President Goodluck Jonathan is a product of masses who went to the streets to ensure he got into power. He noted with regret that the President had allowed the masses to go to the street once more for a policy that was largely against them. He continued that the President was inflicting the pains of the celebrated ‘cabal’ on the masses which wasn’t meant to be the case and if he wasn’t capable of ruling the country or dealing with such groups, the President should give way for someone else to. Fabian Atese Gbatoon, a lecturer with the Benue State University, Makurdi said that the fuel subsidy was a conduit pipe for misappropriation of funds. He averred that if the government doesn’t have any vested interests, it should investigate claims by several people including Davidi Silver. He emphasized that if the government was more transparent in its dealings, it would realize that the issue of petroleum subsidy would become a thing of the past and the masses would leave the streets. Mr. Ternenge Torough, a social commentator and finance expert has also called for proper management of the people’s trust. He however said that the way to solving problems is not by insulting anyone and seriously frowned at the stance of several people in insulting leaders. Torough argues that it is illiteracy and a lack of maturity that would cause people not to attack issues alone but target individuals too and called for more tact when talking about issues. Mrs. Josephine Habba and Lady Grace Shahu, key members of the Civil Society Organisations in Benue state argued that the main stress of the fuel subsidy policy is on women and children. They called for the government to seriously look into the case and work out a favourable plan. 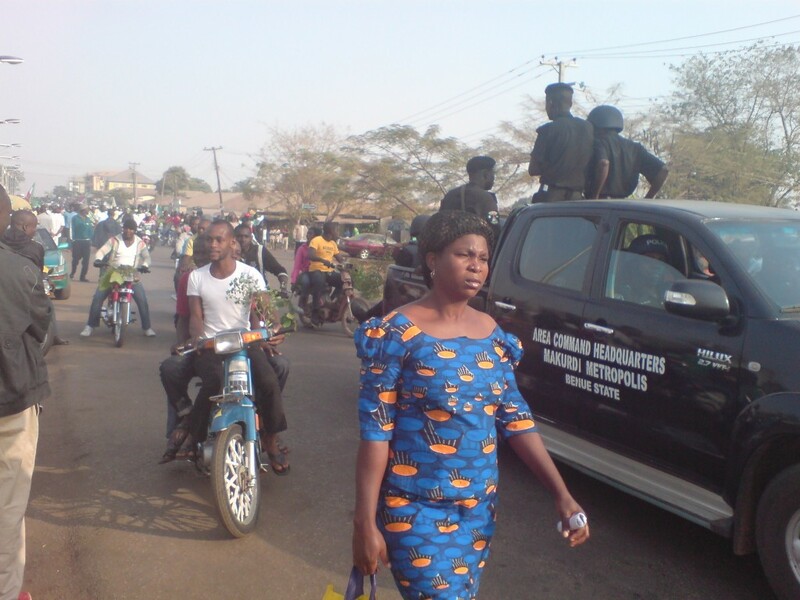 All through, more youths have kept taking to the streets especially in Makurdi, the state capital. They all emphasise that their protests is not just about fuel subsidy removal but is a call for better governance and transparency in leadership by leaders both at the National and local level. They noted that their future was at stake and they had decided to march in protest since they were the key people affected. They promised to keep to the streets as long as their hopes and requests weren’t answered by the government. It hasn’t been a street fight alone though. On various media and the social network particularly Facebook and Twitter, Benue citizens like other Nigerians devoid of party affiliation, have called for the needs of the youth as expressed above to be met. From Doowuese Akegh (@dreamygiorgi), @renay_212, @sueddieagema on Twitter to the comedian, Sever Ayede, Tuleh Spanix Terhile, Nathaniel Gesa and Ukan Kurugh and others on the Benue Family Network on Facebook, FEDVOSA everywhere (Kator Adaaku, Mbafan Aondokaa), there has been a continued interest in the happenings of the fuel subsidy saga and a call for better governance all over. There have also been a great number of people gaining interest in governance issues and reading more finance and political documents while watching more News…It’s no dull moment. There has been disappointment expressed by several people over government’s seeming deafness to the cries of the people. 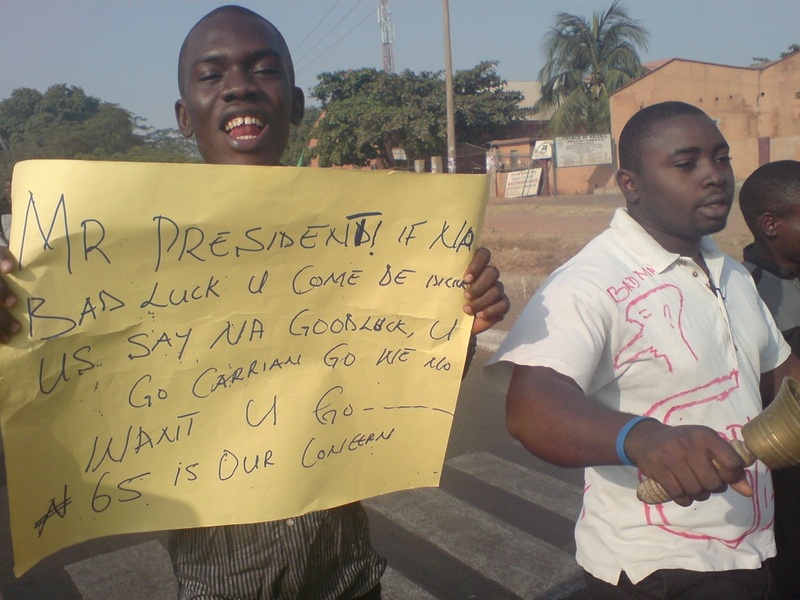 More insulting most of them have said is President Goodluck Jonathan’s failure to address the people. The Benue people hope things get better and are willing to come out to the streets, talk everywhere, argue and even write everyday till that hope is made concrete. Not a few people had to just wonder: ‘Day Five?’ We are out on the streets once more? Well, yes. 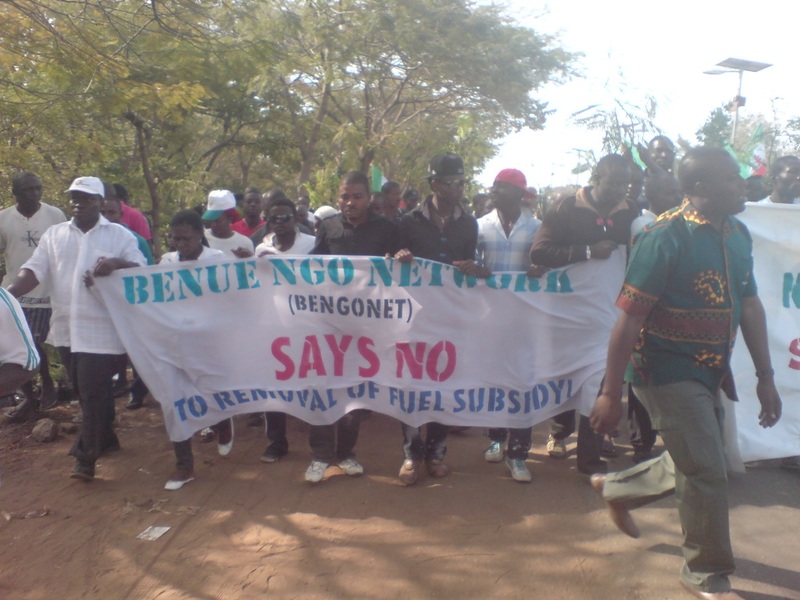 Against the hopes of the people of Benue, the protests moved on to Day Five. On Day Five, Comrade Simon Anchaver assumed the unofficial office ‘Governor for the Day’ and was given the right to pick Commissioners and Special Assistants to help him in executing his office in the protests. Something he did all through. The highlights of the event included a performance by some musicians in front of the Modern Market. They said that the musicians in Benue were against the pains inflicted on the people by the Federal Government and had decided to officially join the protests. 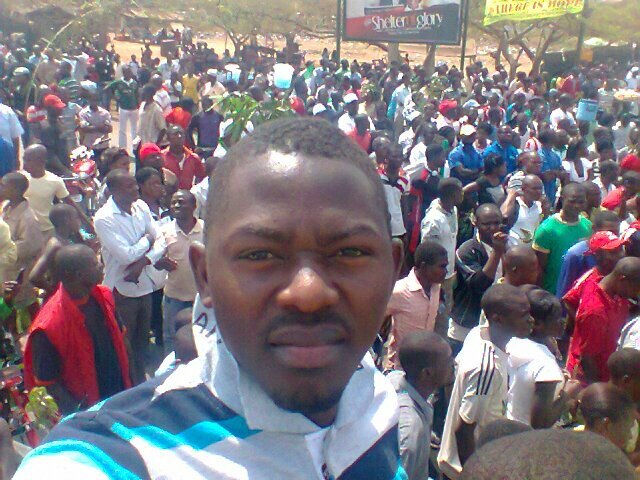 Another high point was at Wadata where the protesters were hailed as heroes by the people. A large number of protesters also joined the ranks from Wadata. Of interest was when the protesters wanted to move to the heavily guarded Government House. It was a day when determination, strength and passion were seen in the eyes and movements of the people. Disappointment however also hung in the air at a government that would allow such protests to go on. The people poured out to the High Level Roundabout by 8am. Like other days, there was the usual morning charges and also, a noticeable increase in number. 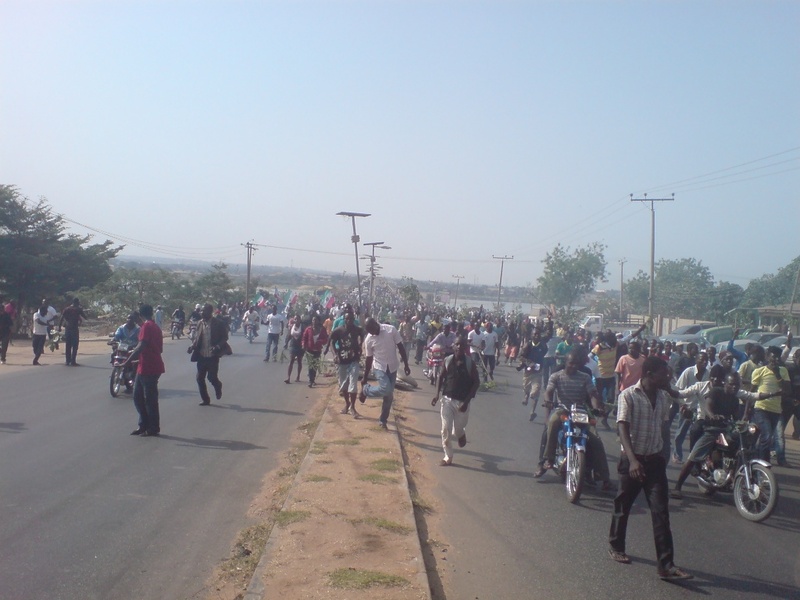 The protesters occupied the streets moving slowly to David Mark Bye-Pass and unto the Modern Market. There was a pause for comments and addresses at the market. The leaders of various organisations and associations represented addressed. The traders of Modern Market represented expressed their support of the strikes and said they would continue to remain shut until the strike was over. They further said that they would keep coming in their numbers to add to the strength of the protests. At this point, some musicians took the floor and performed exciting the protesters with several gospel songs. The movement continued to Demekpe where there was a stop at the NKST church. More leaders addressed the people before the movement continued to Wadata where a large number of people were waiting for the protesters. 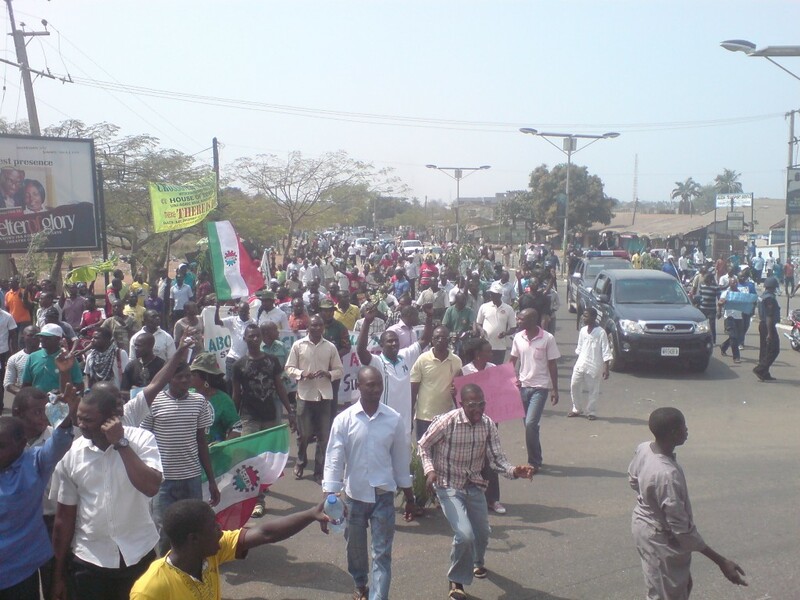 The ward which comprises mainly Hausa people had a number that doubled the number of protesters already represented. Several people also came out from their houses, while some climbed high places to cheer the protesters. The Wadata market had some activity with lots of people present. The Trade Union Congress went to ensure there wasn’t any commercial activity going on and assured that it was thus, they came back to join the protesters. The protesters moved on to the Federal Medical Centre, passing the Central Mosque in Wadata. There was a stop at the Federal Medical Centre. There was a heavy presence of soldiers at the gates of the Centre. The NLC called on Hausa leaders from the Wadata ward who were co-opted into the leadership as ‘special assistants.’ They spoke to the people in Hausa and got thunderous ovation from the crowd. There were shouts of ‘Main naira sitin da biyar’ (fuel for sixty-five naira) in the air. The Sarkin Wadata called on the Christians to join them in their worship through the day, and promised that the Muslims would reciprocate the gesture by worshiping with the Christians in their churches on Sunday. This was greeted with more ovations. He called for unity of everyone in the hope of moving Nigeria forward. After some more addresses, the protesters moved down passing the Holy Ghost Parish, Haf Heaven and Jackies Hotels. The next junction was to be at Tito eatery. Directly in sight was the road to the Government House; most of the protesters moved in its direction. By this time, there was heavy police and civil defence presence ahead with security vehicles barring the way. The police served as human barricade to the protesters. The Labour leaders called on the people to move right towards Royal Choice Inn. This met with some grudges and words of anger. A number of the protesters said they wanted to go to the Government House by all means. After some more persuasion, they listened to the reasoning of the Labour leadership. There was a pause in front of Royal Choice Inn where there were some more addresses. The leaders apologised for the misunderstanding that had just occurred and said that the Government House route had not been marked for ‘occupation’ and as such, there was a need to stick to the original plan. They however assured the people that it would definitely be put into further plans on other days. The explanation did not sit well with the protesters but they let it pass. Some of them whispered that the NLC were simply afraid while others argued that the Chairman, Simon Anchaver was in the pay of the state government and therefore was looking out for the interest of his principals. Some others yet again argued that it was a good thing as a visit to the Government House might have sparked violence since the Governor was not exactly the people’s man. Others cited the case of Niger state and said it had been wise not to go to the Government House. 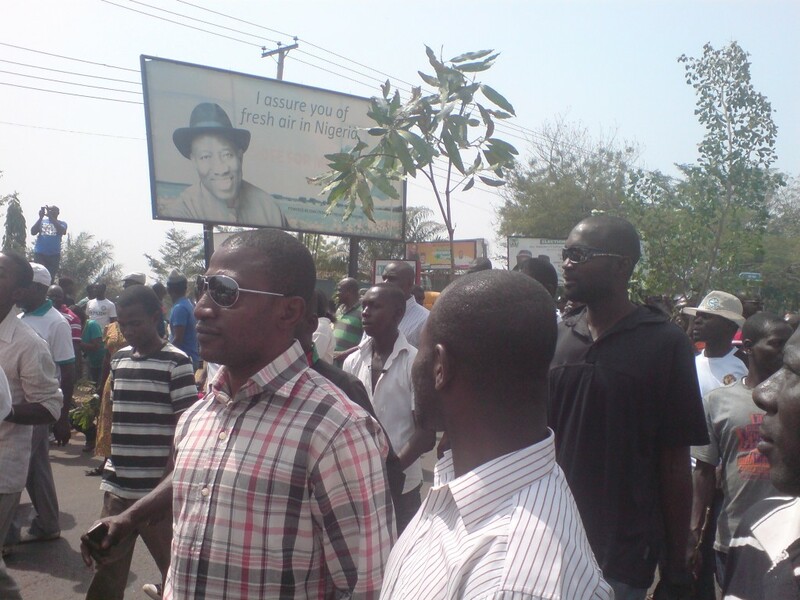 The movement continued passing the banks on Ogiri Oko road, the Mobile Police Headquarters and Police Headquarters. Choruses of ‘Or seer fuel ya naan dzua a i ve’ (Tiv for ‘The person who has increased fuel has gotten into trouble’ filled the air with a solo shouting ‘Kunya kwa’ (TIv for ‘A shameful thing’). The protesters eventually stopped at Tito eatery. Mrs. Josephine Habba, a Childs’ Right Coordinator organised children who had been in the march to come together. She asked them if they could recite the National Pledge. ‘Yes! !’ they shouted and went ahead to sing the National Anthem to the humour and laughter of the protesters who joined in the rendition. Mrs. Habba asked them if they wanted to go back to school and they shouted ‘Yes! !’ She asked them why they were in the march. To the surprise of several people, most shouted ‘N65 per litre! !’ Other children shouted ‘To go to school! !’ The media captured the message well. Mrs. Habba said she hoped that the message would be carried by Simon Anchaver to Abuja. A Barrister, Justin Gbakighir took over and spoke to the people, calling on them to be courageous. Simon Anchaver, the NLC Chairman in Benue and self declared Governor for the day, praised the people for their courage and asked them not to relent in their efforts. He said that he was on his way to Abuja for a meeting with the National leadership of the NLC. He said that Plan A of the protests had been exhausted and that if things didn’t change, by Monday, the people would come out half dressed with most of the men coming out in briefs or boxers to show the shame the government was putting the Nigerian citizenry in. Convergence time was to be 7am at the High Level roundabout. In the interim, the people were free to go and recharge through the weekend for a proper plan B. Generally, the protest rally on Day Four was not dissimilar from those of the previous days. The major difference was that the people converged at High Level Roundabout (the convergence points for the rally have been shifting from day to day). The numbers kept increasing as the movements continued. True vehicles and bikes kept moving and some other people were seen on the roads. However, it was evident that the number of people moving about town had reduced greatly. Also noticeable in the protests on Day Four was the presence of far more youths and women. It seemed they had thought everything was child’s play but noting the seriousness had come out to join. Several other people who had relied on News Channels (but were disappointed) and the social media (especially Facebook) got tired of the reportage which they eagerly looked to. They decided come out to the march instead of post comments of encouragement. Several Federal Government staff absent from the previous days were seen. Some confessed that they had thought the rallies would be over in a few days. Noting that it might not if the numbers were few, they had decided to come join the march. It turned out to be a day of publicity for the state as for the first time, the rallies were seen on AIT. Also, selected people stayed at home to post feeds to various media outlets. The presence of more youth also meant more live feeds to Facebook. It wasn’t long before the full impact of the rallies was seen. Noting the seriousness, a lot of people came out from their houses to join the protests. Those who couldn’t for one reason or the other promised to join. Day Four turned to be a turning point for Benue as it seemed most people came to notice the importance of the march for the first time. 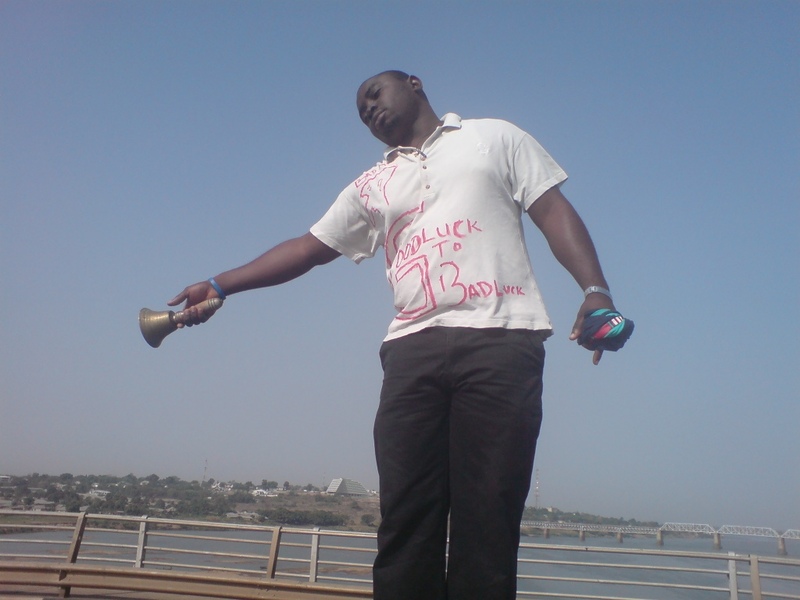 The convergence was by 7am at the High Level roundabout, Makurdi. The people came in their numbers. The number though as much as on previous days was looked at as not being impressive enough. The NLC leaders gave their charge and told the protesters the course that the day’s events would take. As usual, the movement was of the police taking the lead, the NLC vehicles with music, accompanied by okada (commercial motorcycle) riders, then the banners and the main protesters. The march started in earnest with lots of excitement shining in the faces of the people and songs on their lips. 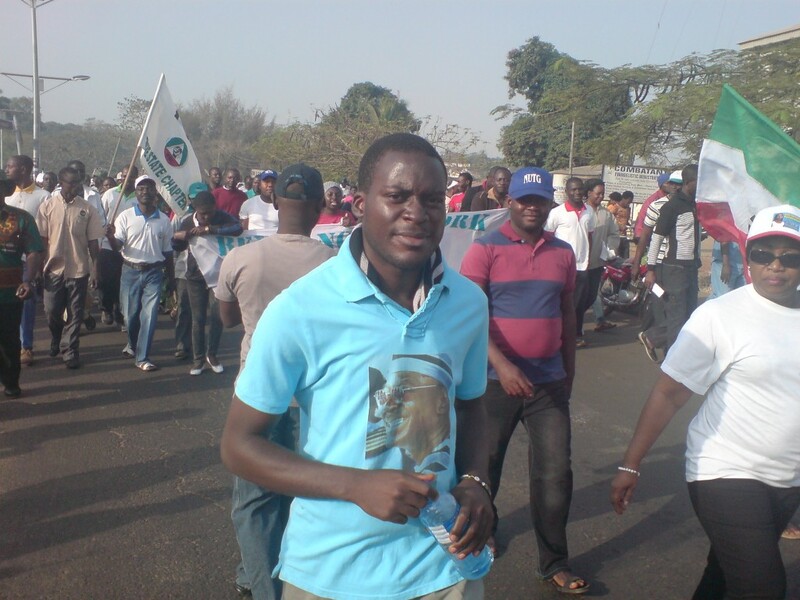 The march moved along the Old Oturkpo road all the way to Aliade Road and unto Kanshio. They seemed determined to reach a new side of town and make their impact felt. There was a stop and some addresses made. The addresses largely centred on the need for good governance, better leadership, and a call for the reversal of pump prices of PMS to their original price. Next, a u-turn was made and the protesters soon found their way to Abu King Shuluwa road. They marched on through different routes notably Akpehe, till they arrived Wurukum passing the market side before terminating at the Wurukum roundabout where there were many more charges. It was announced that the rally would start by 7am with the convergence point being the High Level roundabout. While there was every spark of determination in the eyes and personage of the people, it was several of the protesters expressed sadness and disappointment that the government had allowed the protests to stay this long. Most of the young people who joined the protests for the first time expressed their joy at joining the protests and promised to bring far more people the next day. Meanwhile, most of the protesters from the previous days said they prayed that the government would heed the Nigerian call and answer the demands of Nigerians. They said they hoped that the protests would be the last one. They however swore that if the Federal Government didn’t reduce the price of Petrol or answer to their demands for better governance, they would keep coming out to the streets. Hopefully, there would be no need for that. Convergence as agreed was at Cool Off by 7am. The people had come ready to occupy. The doubled number of people was evident at a glance and impressive. Several came armed with their sleeping materials. The NLC officials announced that the day’s proceedings were to start with a march around town before the eventual re-convergence at Cool Off. The protesters moved from Cool Off Park (Opposite Togo’s supermarket) to the Wurukum roundabout, and unto to Gyado Villa along the Gboko road where the people stopped for an address by various officials. After the lecture, a u-turn was made back to the Wurukum Roundabout where there was a turn to the New Otukpo road. The road which is notably one of Makurdi’s busiest with a lot of banks was dead quiet before the arrival of the protesters and only them seemed the people about except for a few vehicles with green leaves around. The movement diverted to Ishaya Bakut road unto the Police B Division Junction along Old Otukpo road. There was a right turn to High Level Roundabout where the protesters came to a halt after more speeches. The NLC announced that the protests would have to halt for the day and called on people to come prepared for a proper sleepout the next day by 7am at Cool Off park. A lot of people protested against the decision of the NLC to suspend the rally for the day and called for its continuation. Most of this group marched from the High Level roundabout to the Mr. Biggs’ Roundabout to settle at the Cool Off spot where they said they would occupy till the next day. It was noted that during the general rally, more protesters converged at the Cool Off spot with some gathering at other roundabouts around town. These people said they had decided to form separate (but not independent) groups to enhance the power of the protests. Their position was to ‘occupy’ these spots, they declared. There was an absence of a well represented media. The NLC officials and leaders of other represented groups called the various media representatives and asked them why Benue had not been properly reported across the various channels and stations. Only two of the print media represented (one from Peoples’ Daily) could show evidence of reportage of the activities of the rally. One of the TV station reporters said it was usually difficult sending live coverage as there was an absence of a satellite to send messages directly. As such, coverage had to be done and then sent to the respective stations at the end of the day. It was at that time that editing would have to be done on the various clips before presentation. By this time, events usually overtook the reports which would lead to some of them either not being aired or not being aired adequately. Some other reporters submitted that it was the choice of their stations to air what they wanted. The NLC charged the media to shelve their excuses and report objectively all that had been happening. Social media representatives were also advised to keep people abreast of the true events as they unfold. To this extent, certain people were also advised to come along with their laptops and modems. Talks of setting various command posts were discussed. Media strategy meetings were also held by the representatives of the various organisations so that proper reportage of events would be done. 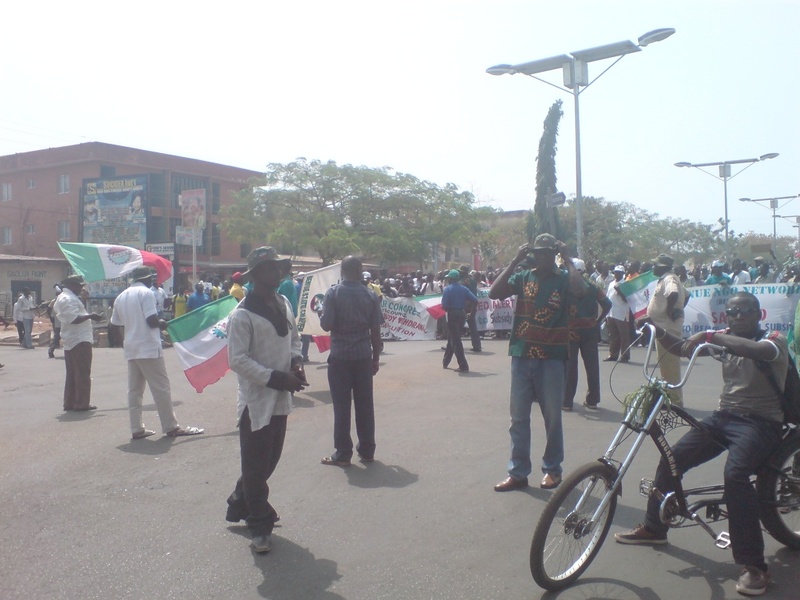 On the whole, cars and bikes were seen on the road, and some shops were open in Makurdi, it is noteworthy that on Day 3 of the protests, far more people, bikers and cars have joined the rallies, more placards and banners have appeared with more organisations coming up to show their commitment to the cause. As it is, the protesters are asking for better governance, a reversal of pump price to N65 per litre or lower, and that the government tackle more pressing issues such as Boko Haram, security concerns, corruption and other vices. Some groups have scheduled meetings including the Civil Society Organisations (at Woodland Park by 4pm), Association of Staff Union of Universities (ASUU), Okada Riders association, Trade Union Congress and others. The plan is to plan effectively in such a way as to operate in consonance with the Nigerian Labour Congress but also have alternative plans since the NLC weren’t showing proper coordination of the whole protests. 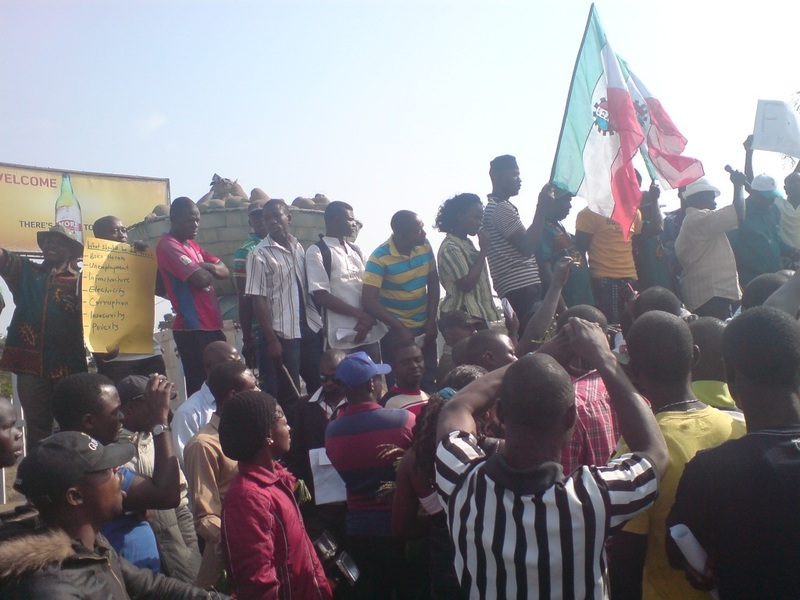 Also, some of the protesters declared that they would continue with the sleep-out at various parts of Makurdi. Not a few people are meeting to strategise on ways to make the protests stronger, with or without the NLC leadership coordination. The convergence place was Labour House, Wadata. Time was 8am. 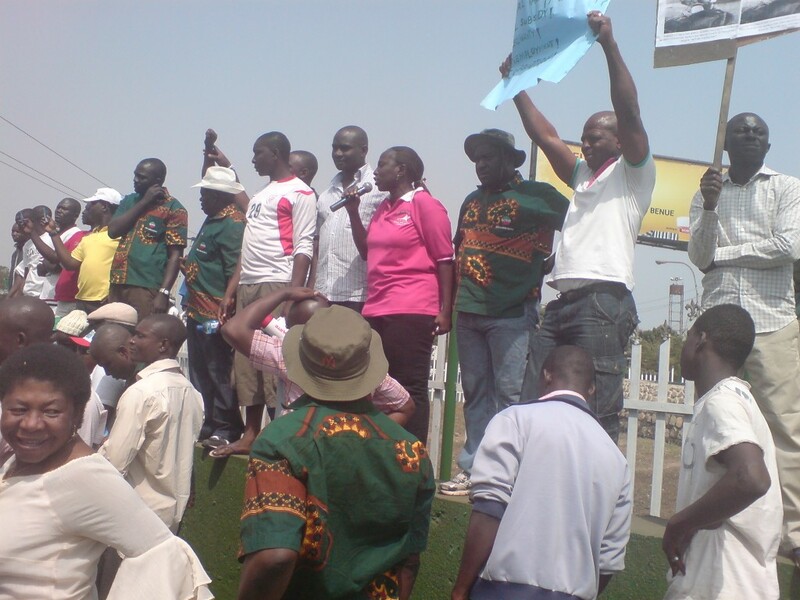 The gathered protesters were addressed by the NLC leadership on the course of the action for the day. The movement was to head through the Police Headquarters Roundabout to High Level, then Modern Market (to close the market as reports had been gotten that the market was open). The protesters were to move from Modern Market to Wurukum stopping at various points for addresses and charges. There was a noticeable presence of far more banners, posters and placards than Day One’s rallies. The first incidence of note came when the police tried to stop a certain man carrying a placard with a cartoon depiction of President Goodluck Jonathan and Vice President Namadi Sambo on a pipe. The people defended him and he was let alone. Meanwhile, except the places where the protest was active, there seemed to be no consideration of the protests in other parts of the town. Most shops were opened by early as 6 am. There were also reports that some petrol stations sold fuel very early in the morning. Black marketers of fuel were about doing their business as were water truck pushers (mai-ruwa). Buses and okada (commercial motorcycles) were all over town. Private cars also moved about in their numbers. Makurdi never looked more normal. Those who weren’t moving about their normal activities, simply took the time to stay at home and rest. The protesters moved till they stopped at IBB Square for some briefing by various leaders represented, after which the movement continued towards Modern Market. At Makurdi International School, there was a call for a pause. The Chairman of the NLC, Simon Anchaver announced that he had sent an advance party who had just confirmed that Modern Market gates were under lock, as such there was no need to proceed. At the instructions of the NLC, there was a U-Turn with Wurukum roundabout, then Wurukum market as the next destination. Some of the protesters did not however find the detour pleasing and expressed their bitterness. 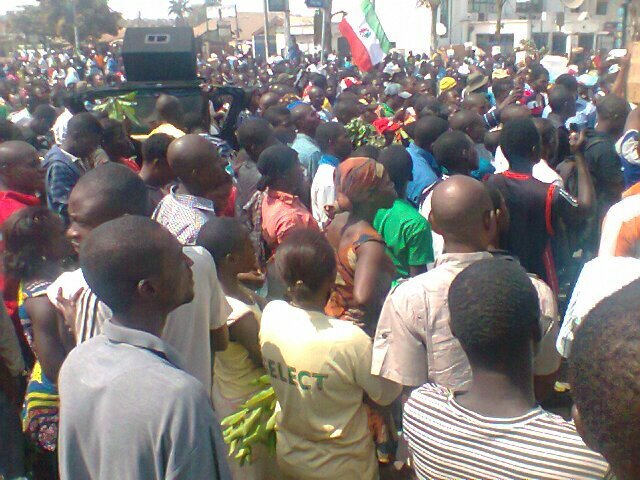 The NLC apologised heavily before the movement continued. 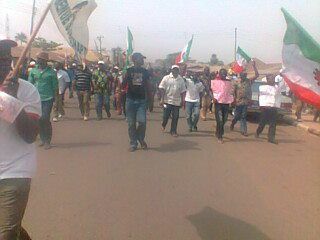 There was a stop at Katsina-ala Street for general addresses to made by leaders again. Another incidence of note occurred just after the School lane. The NLC Chairman called for the protesters to stop at Cool Off Park (a relaxation spot opposite Togo’s Supermarket) for some water and light refreshments before proceeding. Many people considered this as a ploy to make them lose their target area and also, lose time and energy. The general protesters disagreed with his suggestion with a lot of them threatening to leave the march if the Chairman suggested something of the like again. The NLC officials grumbled that the Chairman was taking decisions they hadn’t agreed on. The movement paused at the Wurukum roundabout where more addresses were taken and revelations about government excess expenditure rendered to the people who shouted in disbelief. After the addresses, the protesters made for Cool Off park. At the front of Mainstreet Bank (former Afri Bank), a young man driving a pick-up filled with bags of Our Choice sachet water packed as he faced the mob coming. The mob wanted to rush him and seize some of his water. The police intervened and asked the protesters to allow him. The protesters allowed the young man go, but not without several shouts. Several child hawkers were also noted around. Some police officers spoke about the insensitivity of parents and guardians who would allow children to come to such dangerous places at uncertain times like these. At Cool Off, there were several addresses from Barrister Gbabighir who represented the Lawyers, Lady Gladys Shahu (Chair of Benue Non-Governmental Organisations – BENGONET), Engr. Isaac Bajah, ASUU, and the NLC Chairman, Comrade Simon Anchaver. All the speeches were inspiring and lovely. Barrister Gbagighir read a long speech he had written which only bored a lot of people. Lady Shaahu said the NGOs were in this mainly for the future of the children. She brought out a boy, one of many, who have been in the protests. She said that though the courage of the children was admirable, this was not the kind of future that they wanted to bequeath to children. 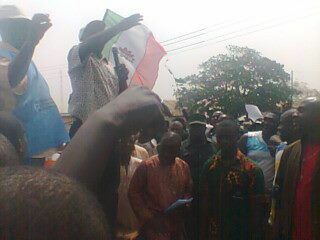 The Chairman , Anchaver declared that the protests would continue from seven a.m the following morning at Cool Off spot. He also advised the protesters to bring along mattresses, mats and the like when coming as there was going to be a sleep out at the convergence venue. No retreat till the government looked into the case of pump price reversal. Seven groups are to be formed to man among areas in the town including the Ministry of Works Round about (High Level roundabout); Wurukum Round About, North Bank Market, and other areas with a central strategy and enforcement team at Cool Off. The National Anthem was sang and people dispersed, anger and passion in their airs, promising to be back with fellow friends and family the next day. The general message was that the convergence was set for 6am at Labour House, Benue Crescent, Wadata, Makurdi. Several people had been warned not to come out for any reason other than the protests due to security reasons. In several parts of Makurdi, things were set to be business as usual. Several corporate organisations ordered their staff to go to work or risk disciplinary action. No one seemed to take anything serious. All over town, small shops were open from Ankpa Quarters to High Level and even North Bank. Black market fuel sellers were seen boldly doing their business. A lot of people wondered if anything was really going to happen at all. Not a few people felt that Makurdi had betrayed the cause. It didn’t help matters that Simon Anchaver, the NLC Chairman was a man who had been accused of being highly corrupt and a bedfellow of the government. The NLC had converged at the Labour House as planned at 6am. There was some organisation and mapping out of plans and strategies for the day’s activities. The general module was announced: it was to be a peaceful rally that would move to High Level through Wurukum to North Bank, the Old Bridge and to Wadata again. Okada men were to lead, then those with banners and the various leaders of organisations represented were to take the lead, followed by the union vehicles, the general people. The security officials (consisting of the police and civil defence) were asked to form the rear as it wasn’t their rally. The security officials however insisted on taking the lead ahead of even the banners and all. The people didn’t argue much. Who argues with the armed in a land of stray bullets? All the police men were spotted to carry weapons with live ammunition. The first incident of note happened a few minutes after the start of the march when some people suspected to be State Security Officials were spotted handing certain bills. A few people discovered the bills were in support of fuel subsidy removal. An alarm was raised and the men were accosted and dealt with, all their materials comprising hand bills and Compact Discs (CDs) were seized. The march continued towards the Roundabout at Ogiri Oko road (close to the Police Headquarters), then to the High Level roundabout where there was a brief stop to address the people by the NLC chiefs. There was also a call that the people chant along Fela’s songs playing changing some parts into Tiv. It had the people chanting ‘Or mbaiv’ (Tiv for ‘thief’) in rhyme to Fela’s ‘You be Thief!’ The movement flowed on to Mr. Biggs Roundabout. There was no stop this time. As the protesters moved, people moved to those who stood by the sides, distributing bills to them and encouraging them to join the protests. The offices of corporate organisations that were shut with staff asked to go home. Meanwhile, small provision shop owners were not disturbed. 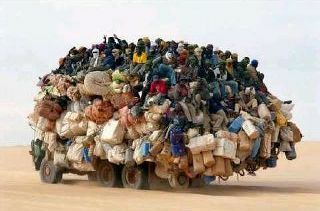 Shortly after the movements started from Mr. Biggs roundabout, a few tire burners were spotted. The NLC Chairman, Anchaver called that the protesters halt. He reminded everyone that the protest was peaceful and that no form of violence was going to be entertained. He asked that the tire burners either clear the way or the protesters would take a different route. The tires were cleared and movement continued. There was a pause at the Wurukum Roundabout where speeches from leaders of the NLC, CSOs, ASUU, and Student Union government were made. The general statements focused on showing the ills and excesses of the Federal Executive Government particularly the Presidency. Records of the expenses of the President and his allowances were read to the bewilderment of the people. There were lots of charges for the people to be strong and say ‘NO’ to the evils of government with a reverse of the price of pump price back to sixty-five naira or lower. The Nigerian National anthem was sang. Next, the songs of ‘Or mbaiv’ and Fela’s ‘You be thief’ filled the air. The protesters faced the New Bridge, the police ahead. At the end of the bridge, there was a large group of youths standing by the road and just watching. There was some confusion as the protesters did not know to whose camp the group belonged. They seemed more of an anti-protest team. There was a silent nearly unnoticeable slowing in the movements of the protesters. There seemed no need for the fear as the youths turned out to be North Bank youths who had heard about the protests and decided to wait for the rally to reach them. They gave shouts of protests and quickly pledged their solidarity singing Fela’s songs with a strange pronunciation of the ‘if’ for ‘ip’ making their chants ‘You be thip.’ The North Bank group formed an advance team and went ahead of the security officials singing their chants. The movement of the protesters changed as the slow turned into a jog. At the Court Five junction, the security officials accosted some tattered suspicious looking men with some bags riding bikes. Most people pointed out that the men looked like ‘Boko Haram’ members especially with their unkempt hair, dirty dusty looks, and filled bags. The police searched them and not finding anything on them, let them go after apologising. The protesters stopped at the NASME Barracks junction for some more addresses which were carried out by more leaders from represented groups. The advance group moved first followed by the Security officials then the formation of the protesters who started from the beginning. They passed the timber shed, St. Mary’s then made another stop close to the North Bank mosque. More addresses were made. Another drama occurred as a car bearing ‘PRESS CREW: OFFICE OF THE FIRST LADY, BENUE STATE’ tried to pass through the crowd. Some people scared the occupants and after fear shown, the people scaring them simply laughed and continued with their protest movements. A lady passing on a bike also had a lot of men grab her buttocks. The songs at this point were mainly calling the President Goodluck Jonathan ‘Bad luck.’ The security officials looked very tired at this point and they all seemed to have their ways to their vehicles. They were no longer ahead of the protesters but behind them. The movement continued onto the Old Bridge where a lot of people marvelled at the inscription indicating it had been built in 1932. There was a stop at the roundabout close to the General Post Office for more addresses. The Okada representatives made the most prominent speech saying they wanted the government to make things right for them (okada) as they were tired of stealing and atrocities and wanted to live an honest life which they believed only better governance would bring. The protesters moved through to the Post office, passing onto Wadata. In Wadata (most inhabited by Hausas), most of the chants were ‘Sai Buhari.’ Shouts of ‘We voted Buhari and you people gave us bad luck’ rent the air. At some point in the movement, some of the security officials left the rally. They appeared at this point, most exhausted. They reported that while the protest was going on, some armed robbers and cultists were operating in some parts of High Level. The security officials had tackled them and enjoined in a chase. Sixteen suspects had been caught. The fatigue was telling on a lot of people at this point. The movement stopped at the Labour house where several closing speeches were made from the CSOs, Student Union Government and NLC. There was a general call that Benue people get prepared to OCCUPY as there was no stopping till the government reversed the price of petrol to sixty-five naira or lower. There were also several calls for transparency in government. It was Mrs. Josephine Habba that stole the show this time. She called for the people to note that the basic need for the protests was for the children and children’s children to come. She said the children of most big men and government people usually stayed abroad and would not fill the pains of the people. Therefore, there was a need for children in Nigeria to feel at home. Mrs. Habba continued that no government official had joined the protests because they have no need to complain as most of their needs were met by the monies stolen from the Nigerian masses. 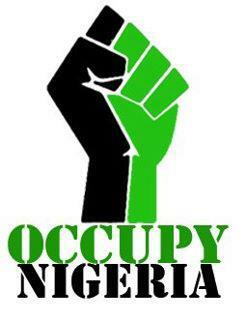 There was therefore a need to OCCUPY Nigeria and Benue and keep it intact! She got a thunderous applause. She wasn’t the only one with the applause as the police were specially commended for being very peaceful and nice. It was noted that in addition to maintaining peace and order, the police had been very polite and nice even to giving lifts to protesters who were fatigued at different points. A general applause was made for the police. It would seem the police seemed to have noticed that they are part of the masses and unfortunate tools used by government against their fellow masses – a stand they had decided to change. The NLC Chairman, Simon Anchaver announced that pending any directive or negotiation from President Goodluck Jonathan, the protests would begin by 8am at the Wadata house. He saluted the mammoth and now reenergised crowd for their commitment. He said though the protests were coming to a pause for the day, day two of the protests would have no pause. Anchaver called on protesters to bring along food, water, two pants (for the ladies), and other necessaries as there were plans to sleep out till President Jonathan changed his mind. Everyone dispersed charged, promising to be back on the second day with all they could. 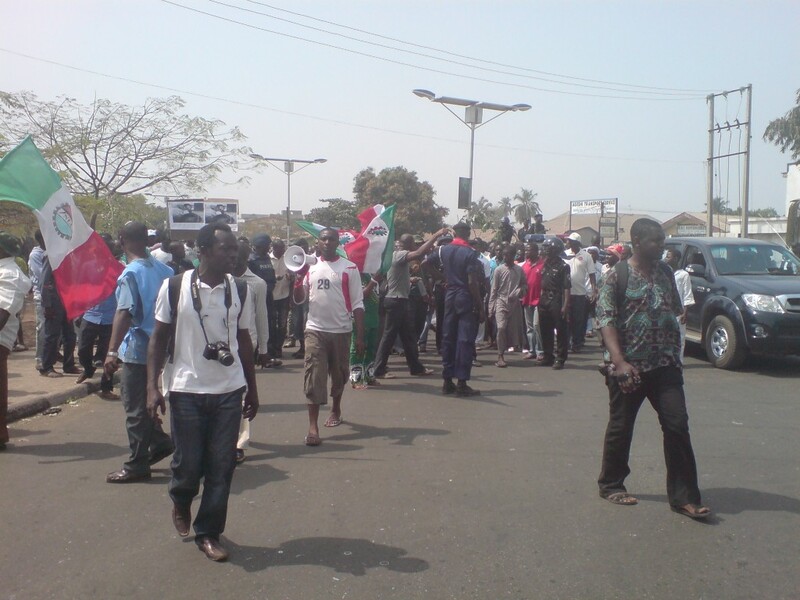 Reports suggest that only Makurdi was active in the protests with other parts of the state being hardly affected. There were reports of businesses going on as usual in Gboko with only car stops being mounted in Katsina-ala. The general telephone networks seemed to have coincidental network problems with calls and text messages being able to come in, calling out or texting imp0ssible. Only MTN had all the services available. This caused people to think there was a deliberate plan to inhibit communication. Soon after the rally, the streets were empty with very few people about. However, by six o’clock, the whole town came to life with all night economic activities taking full force. Petrol sellers and black marketers were in force along with eateries, cyber cafes and other private shops. One might have thought that the Makurdi people have decided to sacrifice their mornings to the protest only to regain it all back with force at night.